When two sisters, Margaret and Stella Stein, walked up the long winding road to the top of Observatory Hill in Allegheny City, Chancellor William Jacob Holland came out to welcome them. 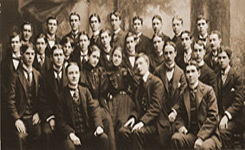 It was 1895, opening day of the fall semester, and they were the first women to enter the Western University of Pennsylvania (W.U.P.) as full time students. The Stein sisters had an advantage over previous female applicants because Chancellor Holland believed that two women could look after each other and keep each other company. The campus in Allegheny City, now Pittsburgh's North Side, occupied land adjacent to the Allegheny Observatory. The school settled there in 1889 after occupying several different buildings in downtown Pittsburgh and a brief stay on North Avenue in Allegheny. Why Did the Stein Sisters choose W.U.P.? The Stein sisters had one other college option in Pittsburgh -- the Pennsylvania College for Women in Squirrel Hill. The women's college was closer to home, but the program at W.U.P. was more to their liking. The sisters made the daily journey from their home in the East End to the school on the North Side to study mathematics, their favorite subject. They took all the mathematics courses offered, plus astronomy, mathematical chemistry, and surveying. Both were "firsts" again when they returned for master's degrees in 1901. Stella went on to teach modern languages and mathematics at South High School, and Margaret became principal at Avalon High School until she married. Maggie and Stella's Cards & Gifts, established in the winter of 2005, is Oakland's premiere card and gift shop and is located in the heart of Oakland. Our newly renovated store is on Fifth Avenue between Starbucks and The University Store on Fifth. We proudly carry an array of local and handmade products created by Pittsburgh artists, along with gifts ranging from the simple and moderately priced to elegant high-end merchandise.